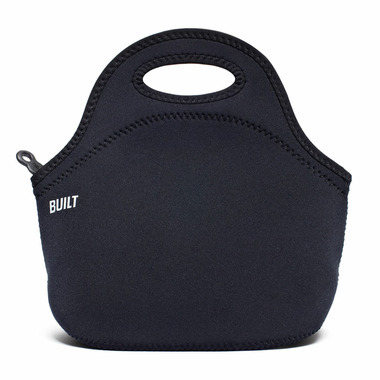 If you're a foodie who spends time in the culinary fast lane, then the Built Gourmet To Go Lunch Tote is for you. Extra roomy, the Gourmet To Go Lunch Tote is 30% larger than the classic Gourmet Getaway Lunch Tote. Expands to fit a variety of food and drink containers and features a secure zipper closure. It's great for road trips, plane rides, or any time you're on the run and need provisions to keep you going. Machine washable so there's no need to worry about spills. And unlike those brown bags, you'll want to reuse one of these insulated lunch bags over and over again. Great, washable neoprene. I had a built brand lunchbag myself for several years and loved it! It was the dog eating it that destroyed it. Nothing else did. This one is fairly large. Fits a standard lunch box, or containers, a water bottle all very easily. I like that it zips very easily, even young children can do this independently.